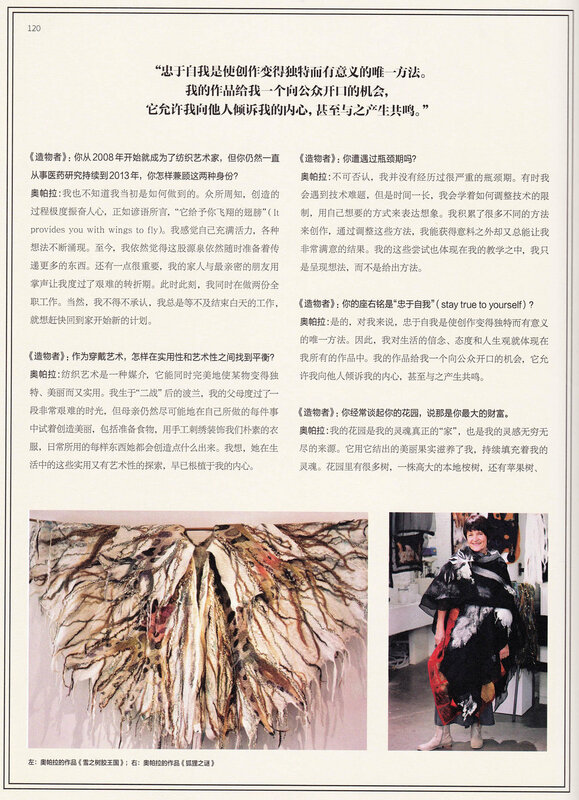 Earlier this year I was approached by the Editor in Chief of New Maker Magazine《造物者》 Zhang Quan to be interviewed for an article in their new beautiful art and design magazine published in China. 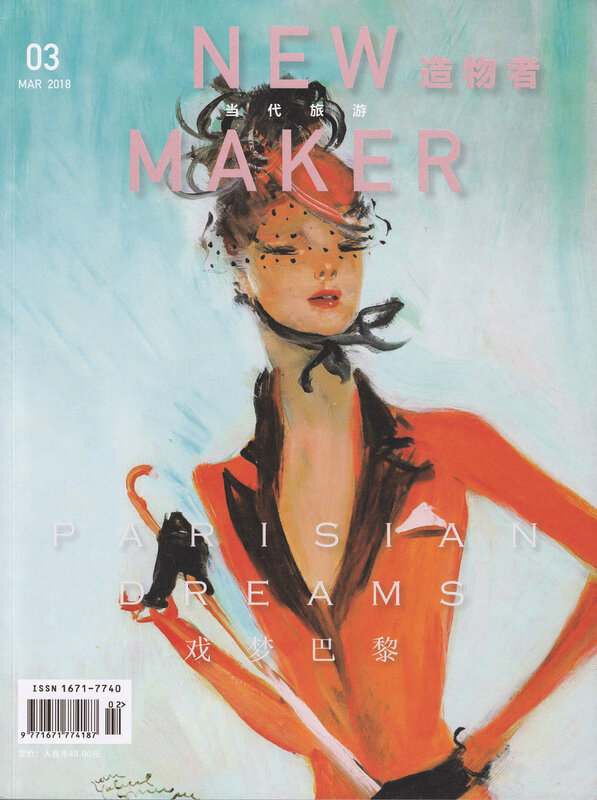 New Maker Magazine focuses on the stories and spirits of craftsmen and artists. 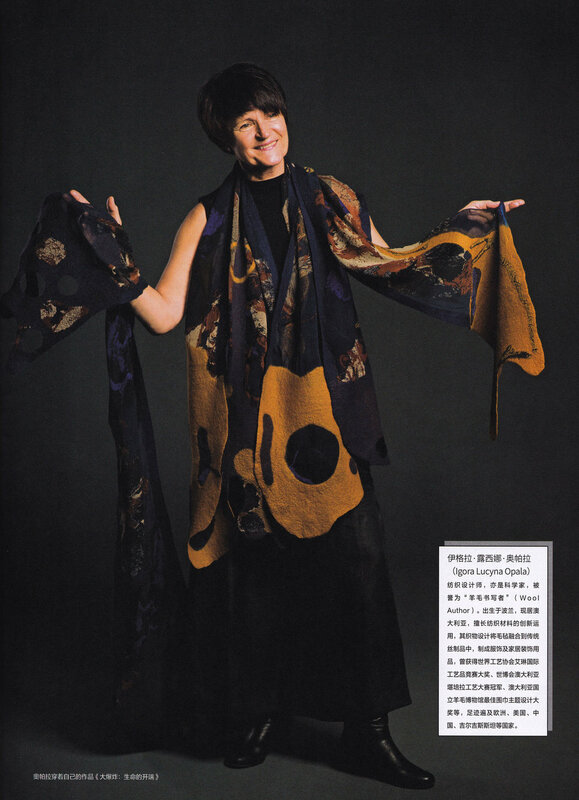 This is a very in depth interview published in the March 2018 edition titled “Parisian Dreams” (p.118-123) discussing the change of my career from medical scientist to contemporary textile artist. The article explores what inspires me in the realm of felting as an artist and designer. 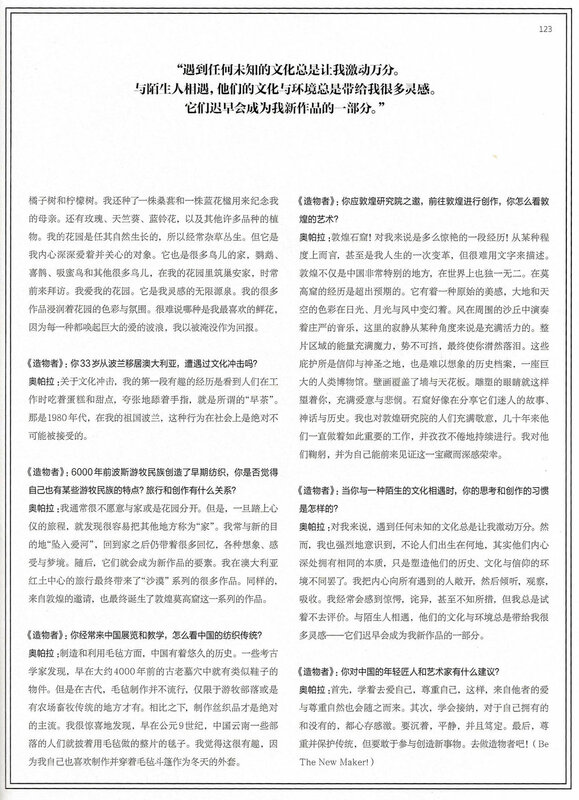 Here are the images from the magazine article featuring my interview "AUTHOR OF WOOL" and below is the transcript in English of my interview with Zhang Quan. 1. You are not only an artist but also a medical scientist for more than twenty years, which remind me of Leonardo da Vinci. You’re good at eco printing of plant material. Were your studies of science helpful to your creation? In hindsight, even my career as a scientist was preparing me for being a creative person. Studying botany, anatomy, genetics, physiology, biochemistry, physics and more opened my mind to micro universe. Having such deeper knowledge greatly helps me to connect on different level with the world. Moreover, with this knowledge, comes an incredible sense of wonder and respect for the phenomenon of Life and its various forms. For example, when eco printing, my knowledge of botany and chemistry knowledge is priceless; the increased level of understanding speeds up the 'experimentation' process and reconnaissance. 2. What do you think about the relationship between science and arts? How could you keep the balance during your creation? For me, the relationship between science and art is that of symbiotic nature. One benefits of the other and it is difficult to separate them. What was first? Art or science? Embracing this 'oneness' assists me in keeping the balance and harmony in my creative process. The scientific knowledge and understanding behind the technique, gives me a solid base for my artistic endeavours. 3. You once said lots of your works in the past created in the lounge room and the kitchen, which remind me of the famous writer Harriet Beecher Stowe. She also wrote her outstanding fiction "Uncle Tom's Cabin" in the kitchen. What was your exact creation conditions at that time? My need and passion for creating was very strong and literally unstoppable. It took by the surprise as well. I did not have studio at that time and simply used a spare 2x2 metre square of my floor, working on my knees. Even so, this was ok. What mattered most was what I wanted to do, convey and create, not my comfort. 4. You became a textile felt designer since 2008, but you were still a medical scientist before 2013. How could you make it? I mean, to combine the two job. When I look back to the beginning I actually don't know how I managed to do it. Admittedly, the creative process is extremely invigorating - as the saying goes 'it provides you with wings to fly'. I felt full of life and full of ideas, to this day feeling like a fountain ready to deliver more and more. The other very important factor was help coming from my partner; ever supportive, ever encouraging. My family and closest friends with their applause and acceptance were indispensable in this difficult time of transition. At this point in my life I worked two full time jobs. I have to admit that I couldn't wait to finish my day job to come home and start a new project. 5. What made your make the decision to leave the job of science and choose to be an artist? The feeling of freedom - that I can be finally true to myself. A career in science these days is a collective undertaking, working as a team, all the time. It is a constant compromise on many levels, including your own set of moral and ethical values and ideas. Being an artist allows me to express myself freely. I definitely was missing it in my life. 6. I am interested in your representative work "Desert after rain". What inspired you to create it? This piece is very close to my heart, probably like all of my pieces. It has literal and symbolical meaning, like most of my work. I wanted to portray a change that occurs both in nature and in us after a long time of drought. The desert responds so readily and so beautifully to the precious water coming in abundantly from the sky in the same way our soul responds to love and care coming toward us. People need love like a desert needs rain to blossom. Nourished deserts and souls can give so much. 7. You create the wearable art. How did you combine artistry and practicability upon it? Textile art is a media perfectly suited to making something unique, beautiful and very practical at the same time. I was born in post “World War II” Poland, a very difficult time for our parents, however, I remember how my Mum was still trying to create beauty in everything she did. This included food preparation, decorating and even adorning our modest clothes with hand embroidery and creating something out of everyday items. I think that her practical and artistic approach to life is embedded in me. 8. Did you encounter any bottleneck? How did you break through it? Admittedly, I haven't experienced any serious bottlenecks. Sometimes I experience technical difficulties but over time, I have learned how to adjust the limitation of the technique to the way I wanted to express my vision. I have amassed many different ways to do things and by varying them, can achieve unexpected but often very desirable results. My approach is reflected in my teaching; I present the ideas, not recipes. 9. Once you said your favourite quote is stay true to yourself. Why？Is there any stories? Yes, for me, staying true to yourself is the only way to create something unique and meaningful. Consequently, my beliefs, attitudes and philosophies towards life are reflected in all of my work. My work gives me a public voice, and allows my heart to 'speak to' and resonate in others. 10. You once said that you would spend your leisure time in your garden. Would you please describe your garden? What kinds of flowers do you like best? Is there any inspirations or relationships between your garden and your creations? My garden is my soul's true 'home' and an endless source of inspiration. It nourishes with its beautiful fruits and constantly replenishes my soul. In it, are many trees; a giant native eucalyptus, apple, orange and lemon trees. I also planted a weeping mulberry and jacaranda to celebrate my Mum's life. There are also roses, geraniums, blue bells and many more species. My garden is wild and usually overgrown, but it is deeply loved and cared for. It is home to many birds like parrots, magpies, honey eaters and many many more ...nesting here and visiting. It is an endless source of inspiration. Many of my works are saturated with my garden colors and vibe. It is impossible to have a favourite flower as each of them evokes in me a huge wave of love I flood them in return. 11. You moved from Poland to Australia 33 years ago. What’s your impressive encounter of culture shock? One of the very first and amusing experiences of culture shock was seeing people at work ostentatiously licking their fingers while eating cakes and sweet buns during "morning tea". At that time (1980's) this was absolutely socially unacceptable behaviour in my home country of Poland. It is usually not easy for me to part with my home and garden. Having said this, once I start my journey I am happy to travel and find it very easy to make new places 'home'. Very often 'I fall I love' with new destinations and return home with many memories in form of visions, feelings and dreams. Later, they become the main ingredients of my new works. My travels to the Australian Red Centre resulted in many pieces of the 'Desert' collection. Likewise, the invitation to Dunhuang inspired the 'Dunhuang Grottos' collection. 13. You came to China for exhibitions and teaching from 2014. What do you think about the tradition of Chinese felt? China has a long history of making and utilizing felt. Some archeological discoveries include shoe like objects found in caves as old as 4000 years. Felting was not widespread in the ancient times; it was most likely limited to the area were there was contact with nomadic tribes or where was a tradition of animal farming. The use of silk was definitely dominant. I was fascinated to discover that in the ninth century, men of the Nan-Chao tribes in Yun-nan wore a one-piece blanket made of felt (as recorded in "Man Shu", by Fen Ch'o, about A.D. 860). Personally I find this interesting as I love making and wearing felt blankets as a winter coats! 14. You made exhibitions in Kyrgyzstan where also had a long history of felt. What do you think about the similarities and differences of textile between these nations: Australia, China, and Kyrgyzstan? Kyrgyzstan has a very long history of using different animal fibres to produce extremely durable felt. As a country of harsh climate, nomadic lifestyle and tradition of farming wool producing animals, Kyrgyzstan is considered by many as the "cradle" of felt origin. The thick and highly insulating properties of felt were practical media to build transportable homes (jurtas) and make decorative and warm floor coverings (shyrdaks). In China, felt making was very regional and special for certain ethnic groups only. This included the Se-ch'wan ,Yun-nan, Tietans, Kwang-tung and Kwang-si groups. Felt came to Australia when the first non Aboriginal settlers arrived, bringing with them both animals and the European tradition of felt. It is believed that nuno-felting, combining wool and fabric, was first developed in Australia. Australia is known for its large scale farming of Merino sheep, with the wool renowned for its refined qualities of being very soft, fine and durable. Combined with silk, Merino wool creates extremely light, warm and highly breathable fabric. What is common to felt in all above mentioned countries is that a very basic technique is used to create the fabric. In short, the process involves spreading the animal fibres, wetting with soapy water and lastly, a laborious process of rolling and beating that results with piece of strong, almost unbreakable fabric. My technique is based on that very ancient technique, with my own contemporary approach to design. 15. How did you feel about Dunhuang grottoes(敦煌)? And your impressive grottoes? Would you please tell your inspiration during Dunhuang? Dunhuang grottoes! What an amazing experience it was. It was life changing for me on a level that is very difficult to put into words. Not only is it a very special place in China, but a place like no where else in the world. The scenario the Mogao Grottoes create is beyond expectations. It is a raw kind of a beauty, where earthy and heavenly colours change with sunlight, moonlight and wind. The wind is playing sublime music in the surrounding sand dunes, and the silence here, is, in a way, dynamic. You don't know if you hear or feel constant movement of sand. The energy of this whole area is almost magical; overwhelming and moving you to tears. The Grottoes themselves, often painstakingly restored, are incredible. These sanctuaries are places of devotion and holiness as well as unimaginable historical archives. A huge museum of humankind. Frescoes completely cover the walls and ceiling. The eyes of the sculptures are looking at you with love and compassion. It is like the Grottoes are sharing their fascinating stories, myths and historical facts. I wasn't surprised that people from all over the world are coming here in great numbers to witness and pay respect to this astonishing phenomenon. I am so full of respect for people of DunHuang Academy who continue such important work, that the others started many decades ago. I bow my head to all of them and feel privilege to be able to witness this treasure. 16. When you encountered a foreign culture, what’s your habit of thinking and creation? It is always exciting for me to encounter an unknown culture. However, I am always acutely aware that deep inside, people are intrinsically the same, no matter where they are born. What varies is the environment that shapes people's history, culture and beliefs. I open my heart to people, listen, observe, absorb. Very often I am amazed, surprised, even bewildered but I try to be non-judgemental. 17. Would you please give some advice to Chinese young artists? Firstly, learn to love and respect yourself - the love and respect for the others will come automatically, as a result. Connect genuinely with people and with your heart. Open your mind, be compassionate and give people what you would like to receive. Work out your set of life values and stay true to yourself. Learn acceptance and be grateful for what you have and what you do not. Be poised, calm and confident. Lastly, respect and preserve traditions, but dare to participate in creating new ones.